The Fairmount Fibers team is busy with preparations for The National NeedleArts Association Summer Show in Columbus at the end of the month. If your local yarn shop is in attendance, they will have the first look at our upcoming Fall 2015 pattern collection in your favorite Manos del Uruguay yarns. Of course we will let you know when the patterns are released to the public! In the meantime, we'd like to share with you a number of new patterns from various designers that have been published recently, to keep your needles and hooks busy. 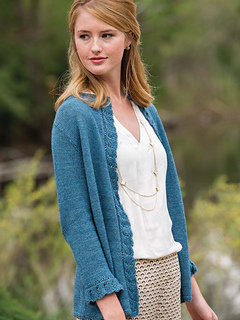 The Rhetta Cardigan is one of the designs in Warm Days, Cool Knits: Lighter Designs for Every Season, by Corrina Ferguson. This is a sweater that is just right for in-between days, or to keep away the chill of air conditioning. Knit in Serena, this is a lightweight, yet warm piece you'll carry with you frequently! The June 2015 issue of I Like Knitting includes the Wildfire Block Cowl, a fun short-row cowl designed by Angelia Robinson. Manos Lace and Silk Blend are striped to create a unique accessory. Drape it over your shoulders or wear it doubled around your neck! Woolly Wormhead has released two new hat designs in Manos yarns this month that are part of the Painted Woolly Toppers collection. This bundle of patterns is designed specifically for hand-dyed, painted and variegated yarns. 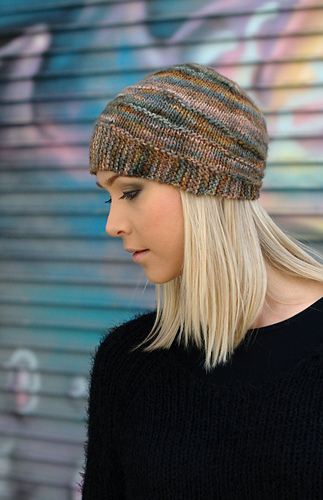 Quoin, shown left, is worked in Wool Clasica with short rows and an asymmetrical brim. Cornice, shown right, is worked in Silk Blend and features unique integrated earflaps and a pompom. The Bruges Multi Shawl, in the Crochet! Summer 2015 issue, imitates lace worked historically on bobbins. Four skeins of Serena are used to create a shawl with basic crochet stitches resulting in an eye-catching accessory. Which Manos del Uruguay yarn are you currently working with, and what's your project? We'd love to see your photos - you can share them to our Facebook page, Ravelry group, or tag us in your Twitter and Instagram posts!